In today’s scenario of Internet of things-driven economy, smart grid transmission equipment is the important component for the development of smart grid networks. Creating smart cities, electric vehicles and other developments require continuous transmission of power operations and through a reliable and smarter transmission and distribution (T&D) equipment system. Though demand of electricity has increased but the global trade of T&D equipment has not increased significantly. But in the coming years smart grid market will be rising and the demand for electricity is expected to get doubled and thus, the demand for T&D equipment will also increase. Goldstein Research analyst forecasts the smart grid transmission equipment market size is set to reach USD 4.5 trillion by 2024, registering a CAGR of 17.5% over the forecast period. The report covers the present ground scenario and the future growth prospects of the smart grid transmission equipment market for 2016-2024 along with the statistics of smart power grid transmission global investments. We have calculated the market size and revenue share on the basis of revenue generated from the major players and total sales of smart grid transmission equipment across the globe. The rising trend of technology based gadgets in developed nations such as United States, Australia are triggering the sales of smart grid transmission equipment. On the basis of this aspect, we have forecasted the global smart glass market till 2024. On the basis of equipment type, high voltage direct current (HVDC) has the highest market share accounted for USD 80.4 billion and is expected to grow at a CAGR of 8.3%. Its demand is more due to the ability to make electricity travel longer distances, with reduced losses and costs as compared to traditional high voltage transmission lines. Smart grid transmission equipment Market Outlook 2016-2024, has been prepared based on an in-depth market analysis from industry experts. The report covers the competitive landscape and current position of major players in the smart grid transmission equipment market. The report also includes porter’s five force model, SWOT analysis, company profiling, business strategies of market players and their business models. Global smart grid transmission equipment market report also recognizes value chain analysis to understand the cost differentiation to provide competitive advantage to the existing and new entry players. 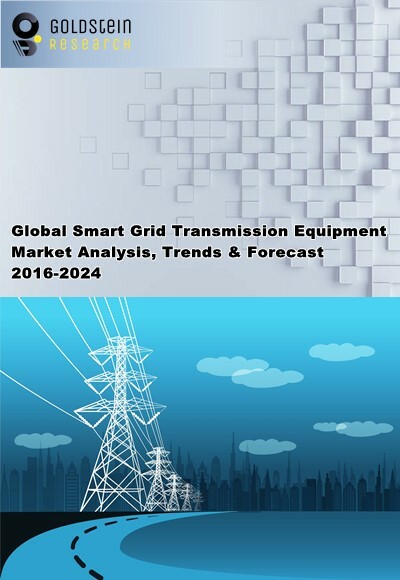 According to the report, major driving factor for expansion of global smart grid transmission equipment market are the less matured smart grid markets that attract the T&D equipment market for the development and modernization of the smart grids, and to establish a better connection between the supplier and consumer. These areas provide opportunities to import more equipment from the developed regions such as U.S., leading the global smart grid transmission equipment market to rise. Further, the report states that the major challenge is a need for risk management of smart grid cyber security. Cyber hacking of smart grid networking can lead to shut down of power being supplied to various important areas such as defense related areas or for the regular activities in an economy. For instance, in 2015 Ukraine’s energy grid was attacked and power transmission was disabled which left 225,000 people without power. Based on geography, North America dominated the smart grid transmission equipment market. US total T&D equipment exports accounted for USD 2.0 billion. Mexico tops the T&D equipment sub-sector rankings because it benefits from the established distribution channels, same grid frequency operation, close regional proximity to the United States and higher growth in electricity demand. Latin market, Asia-Pacific and African market are more likely to grow after US, as the high population is connecting and development towards better performing T&D equipment. Opportunities for U.S. exporters will persist being the largest transmission and equipment manufacturers. Our global smart grid transmission equipment market report comprises of the following companies as the key players in the smart grid transmission equipment market: ABB, GE-Alstom, Prysmian, Schneider Electric, Siemens, Burns and McDonnel, 3m, Power Engineering International, Sterlite Power. Other high-flying vendors in the smart grid transmission equipment market are: Zhuhai Gopower smart grid ltd., Huawei, CESI, Enphase Energy. What is the revenue of smart grid transmission equipment market in 2015-16 and what would be the expected demand over the forecasted period?